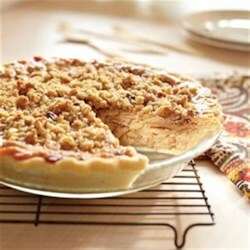 "Apples in a sweet, creamy base are topped with a walnut crumble and baked until apples are tender and topping is golden brown." I have just used this recipe. I don't know if i did something wrong, but the filling was seeping juice possibly from the fruit. Should i use this again, i will add a tbsp of cornstarch. Definitely will make it again. "Delicious"!! Added nutmeg, allspice, and vanilla extract. Will likely increase the walnuts next time, or consider pecans. The pie turned out amazingly. Tasted yummy once I baked it for another 40 minutes. Maybe it was the kind of apples I used and the fact that I forgot to add the cornstarch many recommended.